We’ve refreshed our blog on the available Microsoft O365 collaboration solutions. Determining which tool to use can be a challenge. When do you use Microsoft O365 Teams? Or Groups and Planner? What about Yammer, OneDrive and SharePoint? In this blog we will review the advantages and disadvantages of each tool and how you can determine which best fits your business and team collaboration needs. Microsoft O365 has software tools that can greatly improve online information sharing, collaboration, document and task management. Teams, Yammer, Groups, Planner OneDrive and SharePoint all provide features to help people work together. But which tool do we choose? Some of the tools, like Teams and Groups, are mashups of existing O365 features combined in a new interface. 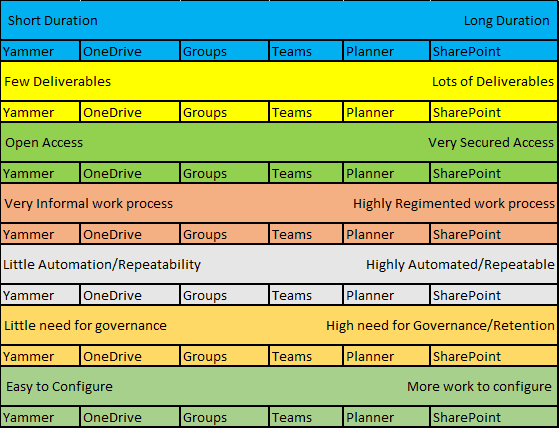 Many times features overlap between tools, like OneDrive libraries in Groups and OneNote notebooks in Planner, both of which are available in SharePoint Online. Many organizations want to standardize their collaboration work processes. This reduces training time and the chances for “lost” data and inconsistent work steps. The decision as to which tools to use should reflect the types of collaboration activities your organization conducts. Duration – What is the timeline of the collaboration process? Are a couple of users spending 1-2 days to update a document or is this a software rollout that will takes weeks to accomplish? Deliverables – What are the outcomes of the collaboration? Is it an update to an existing document or are we creating dozens of pieces or collateral or components that will be used by a customer? Access – Who gets to participate in the collaboration? Do we want to be able to quickly add or remove participants or do we need to have regimented security and access to the work? Formality – How formal or informal is the collaboration? Do we just need to have a team discuss some ideas and make a decision or does the work process need to be performed in a specific manner with assigned tasks and deadlines? Automation/Repeatability – Does the outcomes of the collaboration need to be formally reviewed and approved? Do we need automation to make sure the deliverables get to the right person or place? Governance and Retention – Do we need to be able to categorize and manage the deliverables from our collaboration in order to maintain business records or audit the results of our efforts? Ease of Setup – Do we need to have tools that our users can quickly set up and start using? Yammer provides an open, quickly configurable venue for team members to share and discuss ideas in an unstructured format. Companies that need a venue for general conversation about a variety of topics, where there is little need for formal timeline or task management or need for a formal document editing process can use Yammer as a business collaboration tool. When should I use OneDrive? OneDrive for Business is intended to be a personal, on-line repository for documents. The Sharing functionality makes it easy for the OneDrive owner to share documents with others. Using Office Web Apps, users can edit documents online. Because an individual person controls access to the documents in the OneDrive library, OneDrive is a viable tool for a few individuals to make edits to a document where there is no other formal controls needed. You should plan to move or copy the finished document to somewhere it will be accessible to other. Groups provide a toolset combining Exchange/Outlook features with a stand-alone team site library. Users can quickly create Groups via Outlook, add members and have an Outlook Calendar and Document library with SharePoint document management features to create and co-author documents. Companies that need for all users to be able to create collaboration spaces and work on documents together can use Groups as a business collaboration tool. When should I use Teams? Teams have a many similarities to Groups, and are essentially a mashup of existing functionality in a new interface. Teams include a SharePoint Team site as the back end for document management, SKYPE features for discussions and video conferencing and One Note for ad-hoc notes. Users can easily add users to Teams, similar to Groups. Teams should help organizations that need tools to replicate face-to-face idea discussions in an informal manner. When should I use Planner? Planner extends the functionality of Groups to provide task management and additional collaboration tools, like OneNote. These additional features allow more formal management of the work process, allowing the group leader to manage timelines and assignments. Access and set up is more controlled, but takes more time and training than Yammer, Groups and Teams. A OneDrive library provides a venue for document editing. Companies that need tools for more formal collaboration and task management needs and have longer collaboration work cycles (like Projects) can use Planner as a business collaboration tool. SharePoint provides the largest set of tools and capabilities for collaboration. 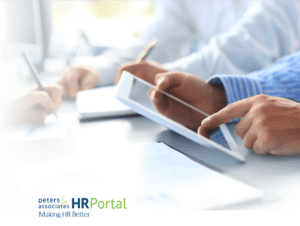 As part of an Intranet, Project Management Office or document management application, an organization can create a customized solution for a variety of collaboration needs. SharePoint tasks, workflows and application development capabilities provide a mechanism to create automation to support formal, standardized work processes. SharePoint security and governance features provide the means to categorize, secure and manage deliverables over time. Can a mixture of O365 solutions work? Absolutely! Most organizations have a variety of collaboration needs, so using more than one of Microsoft’s collaboration tools provides users with more flexibility. The key to providing the right solution(s) is to evaluate your business processes and determine which tools you best meet your specific business need! Need help evaluating which tools to use? Peters & Associates has been assisting organizations in solving business problems since 1981. We can help you to evaluate your work processes and determine which of the available collaboration solutions best work for you. Contact us at info@peters.com or 630.832-0075 for a free consultation.